bl.uk > Online Gallery Home	> Online exhibitions	> Asia, Pacific and Africa Collections	> A Pathan's Tomb [?Lahore]. 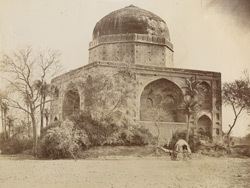 Photograph of a Pathan's Tomb in Lahore from the 'Bellew Collection: Photograph album of Surgeon-General Henry Walter Bellew' taken by an unknown photographer c.1870. The Pashtun or Pakhtun (pathan) are Pashto-speaking people inhabiting parts of south-east Afghanistan and north-west Pakistan. This view of the tomb shows a square structure surmounted by a dome.